ホーム > CD/TAPE > MIX CD > Y.O.K.O. / HOW MANY STYLE? MANY STYLES!! Y.O.K.O. 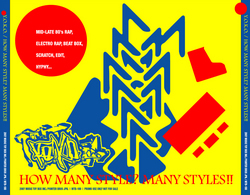 / HOW MANY STYLE? MANY STYLES!! THE PRINCE WHIPPER-WHIP / BACK 4 MORE WHIPNOTIZING!! !